Recently WhatsApp users have received notification in Android and iOS app regarding new terms and conditions for their users. As per this notification, WhatsApp will soon start sharing user data with parent company Facebook. Millions of users have already accept this policy by clicking "I Agree" button, provided in notification without read details. How to revoke WhatsApp new terms? If you’ve already accepted new terms of WhatsApp, you can still opt out – as long as it’s within 30 days. You can do that by heading to the settings menu in the app, and pressing on the account tab – there you’ll find a “share my account info” button that you can undress and revoke your permission. Note: It is not clear that opting out of the new terms will change the user experience at all, either comparing people who are still having their data shared on Facebook, or with before WhatsApp introduced the change. See also: How to use WhatsApp on PC? You can see option "Share my account info"
Share my WhatsApp account information with Facebook to improve my Facebook ads and products experiences. Your chats and phone number will not be shared onto Facebook regardless of this setting. Be careful while agreeing to new terms and conditions on WhatsApp...... messaging app's new terms of service. 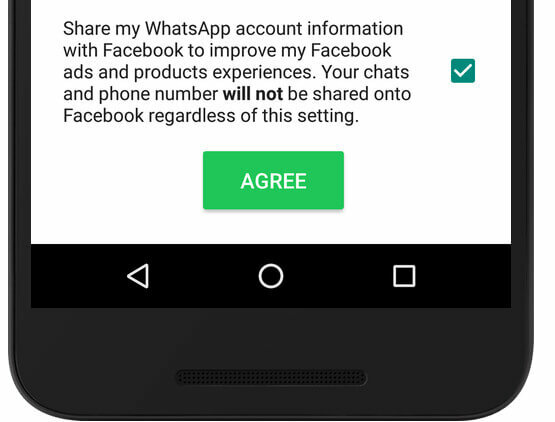 Rather than clicking "agree" blindly, press the smaller "read more" option below, and unchecked the box that reads "Share my WhatsApp account information with Facebook..."
Don't worry if you've already accepted those new terms, however — you've still got 30 days to opt out. Head to the app's settings menu, and then press the account tab. From there, you can unchecked the box reading "Share my account info" to stop providing Facebook with your user data.